Enter to WIN 2 Tickets!! I’m the type of person that will literally bet you on anything and everything I possibly can, and I’ll also go out on a limb to state that I’m annoyingly competitive. In Laymen’s terms: I will yell and scream until I win. Because I always win whatever I bet against. 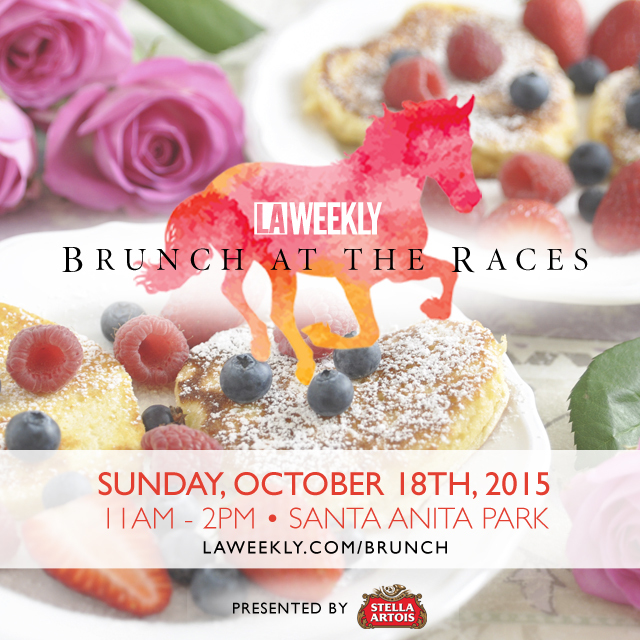 With that said, you can probably guess my excitement when LA Weekly announced their event, Brunch at the Races, taking place at Santa Anita Park October 18th from 11am-2pm. There’s nothing more quintessential LA than brunch, so when you pair handfuls of LA’s top brunch spots WITH gambling, the result is me needing to sit down at the thought of the amazingness that will be going down during this event. Some of the awesome restaurants taking place, include:10e, Abigaile, Auntie Em’s Kitchen, Beachwood Café, Bierbeisl Imbiss, The Blue Owl, Cassell’s Hamburgers, Chago Ahogadas, Cindy’s Eaglerock Restaurant, Du-par’s, Flores + Sons, Fred 62, Goldie’s, Go Get Em Tiger, Chef Johnny Lee, Jones Coffee Roasters, Little Dom’s, McConnell’s Fine Ice Creams, Myke’s Café, Nickel Diner, Olive & Thyme, Poppy + Rose, Poppy Cake Baking Co., Semi Sweet Bakery, Sonny’s Hideaway, Status Kuo, Sticky Rice, Superba Food + Bread and Sweet Butter Kitchen. Sip on drinks from favorites such as Knob Creek, Stella and bloody mary’s, mint juleps and mimosas from Soleil. After you’ve been liquored-up, stop by the Etsy vendor village to do a lil’ shopping, and of course, take in a few races, as admission gives you a full-day access to the track. The awesome people over at LA Weekly have given me two tickets to giveaway to one lucky reader! ENTER HERE!!! Tickets can be purchased HERE, with general admission prices starting at $45 ($55 at the door), VIP $65 ($75 at the door. Purchase this ticket for an extra hour at the event, along with a VIP gift bag). The amazing peeps over at LA Weekly has graciously invited me to Brunch at the Races as media. All opinions, like always, are my own.